At Austin Community College, ACC Student Leader and Interim Secretary and Community Liaison for Black Student Success Committee, Grant Loveless, coordinated black history month events with the BSSC and other student-led organizations (Black Minds Empowered, Austin Community Corps of Engineers, SWAP (Students With A Purpose) and ACC’s Student Government Association). Former (2017/2018) PAC CTN club president Ashley Dovalina will transfer from PAC to Our Lady of the Lake University in the fall. Ascender ACC held their annual Motivational Conference, titled “Stolen Education” on February 8th, at the Eastview Campus in the multipurpose room, where more than 100 students, teachers, and mentors gathered to watch a documentary by UTSA professor Enrique Aleman. Palo Alto College hosted their College & Career Mentor Conversation Dinner on Wednesday February 18 from 5 pm to 7 pm. Club sponsor and Ascender instructor, Esmeralda Macias, invited students to attend the Women Writers Speakers Series on the STC Mid-Valley campus. Congratulations to CTN journalism intern, Grant E. Loveless, for being selected to be a Marketing & PR / MR intern for the Austin Film Festival. STC held their end of semester gathering on December 4th. Students and faculty enjoyed tamales, chips and queso, hot chocolate with toppings, candies, and pan dulce. Mrs. Macias shared highlights of the semester with her students, and they also played games. ACC students celebrated the end of the fall semester with a celebration called Posada, which they learned means “inn” and is a re-enactment of Joseph and Mary’s search for a place to stay. Posada is celebrated in the Latino culture beginning December 16th and ending on the 24th. The ACC Ascender club hosted their 2nd Annual Toy Drive for Dell's Children's Hospital which ran from November 19th-December 12th. Toys were also collected for the Hays Police Department Brown Santa Program and Blue Santa. 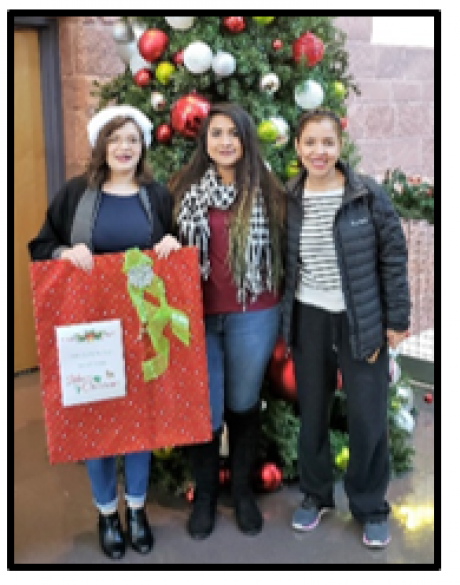 Club president, Ivanna Soriano, and sponsors Alejandra Martinez and Ariel Flores dropped the toys off at the hospital on December 15th.